Yeah, it’s a huge burrito, and it was good. 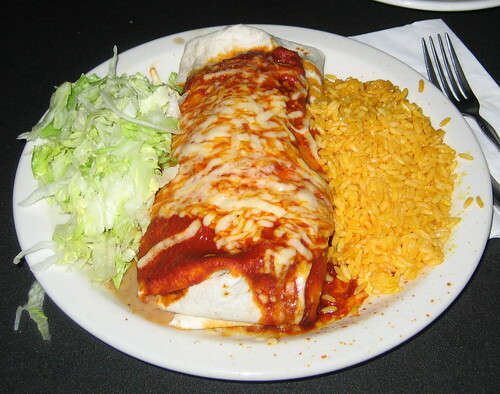 When you think huge burritos, Highland Park probably doesn’t pop into your head. Well, that’s your problem, because Tamales in downtown Highland Park makes a killer burrito and this place will also wow you with an impressive, all-around great dining experience. Just so you’re not confused, you may have known this place by it’s former name. It used to be Hot Tamales, but it just changed ownership, so now it’s Tamales – A Mexican Joint. I know this because we had the new owner spend about 10 minutes at our table talking about the restaurant and Highland Park in general. He’s a cool guy and I think the future of great Mexican food on the North Shore is in good hands. Before we go any further, let me digress into my rankings of “top suburban downtowns,” here they are. More on that another day, but be sure that the Highland Park downtown is a keeper. So, pictured is the steak burrito. It’s got beef and beans and a great salsa. It’s large, but it only took me about 12 minutes to get it all into my stomach. It felt like the bean to steak ratio was about one to one. That’s the balance we shoot for here at Tasty Chicago. I don’t want one major item overpowering the other and you get that at a lot of other places. Not here, this burrito is well-made. There are a bunch of other reasons to go here. My wife had the skirt steak and liked it. Just for the heck of it, the owner brought out some special mushroom sauce for the skirt steak and it was darn good. 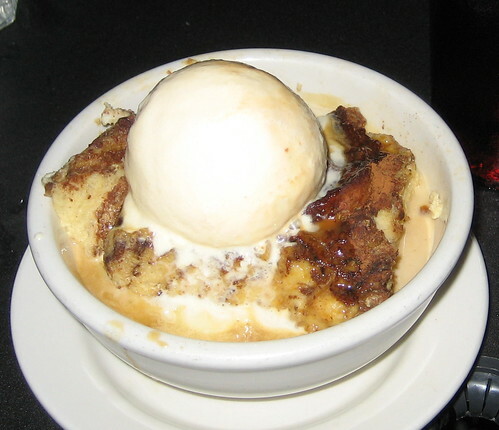 Also, check out the bread pudding with ice cream and caramel sauce below. Mmmm, tasty. It was about a 30 minute wait, but what do you expect on a Friday night. We dined outside on that main east-west drag through downtown. What a great atmosphere. The service was extremely friendly and I will be back. Posted in food on 2007/08/08 by John.